It seems like long nails are making a major comeback. Celeb fans include Rihanna and Kylie Jenner, but style risk-taker Lady Gaga sported some long nails on her Instagram, and it's definitely a "you'll love them" or "you'll hate them" kind of look, as with just about everything the pop star wears. Who said nail art was dead? Gaga snapped a pic of her mani (and her insanely large engagment ring) and the hand selfie showed off some crazy long acrylics. The pop star captioned the pic by coining the acrylics "Jersey nails," so perhaps Gaga got inspiration by tuning in to The Real Housewives of New Jersey. Something tells me those ladies would approve. These French tips are so exaggerated that it looks almost like the manicurist forgot to cut down Gaga's tips at the salon. But hey — go big or go home, right? 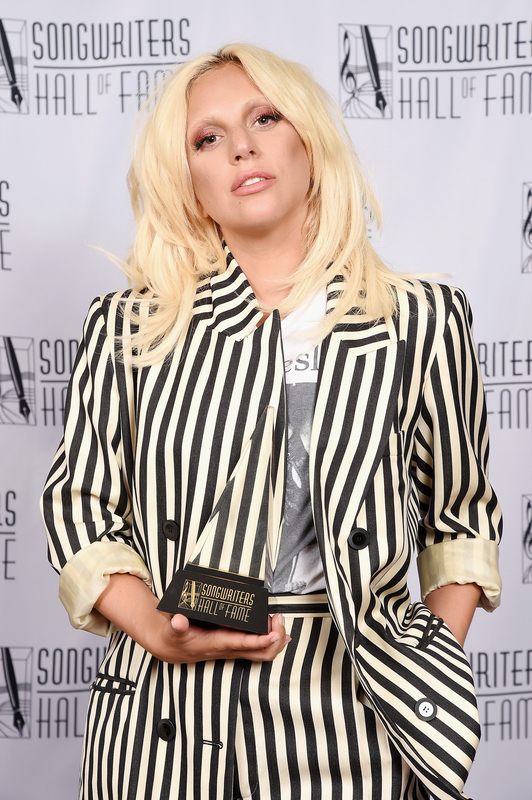 This look comes as a surprise given that Gaga has been taking a scaled back approach to personal style lately. I mean, she has been rocking jeans for quite a while now. But this mani will definitely give you flashbacks to the risqué, jaw-dropping, "Bad Romance" era Gaga. Take a look at the nails below, and see for yourself if you'd like to take note and try out some major "Jersey nails" for yourself. If you are an avid Gaga-follower, you will know that this is not the first time she's rocked some pretty intense nails. Take a look at some other insane Gaga manicures that she's shared with her Little Monsters on Instagram. They range from the avant-garde to the just plain normal. This look will make you want to add glitter to your next nail look, because honestly who doesn't love a little sparkle? Okay, this is a lot of sparkle. Lots of celebs, like Kylie Jenner, have been rocking this acrylic nail shape for quite some time, and even if fake nails aren't your thing, you've got to admit this is a pretty elegant look. Unlike Gaga's current look, these French tips are a little more practical, and a pretty clean, easy style to rock. These long, black dagger nails are a major style statement, but if you want to make your look a little bit goth, then it's definitely a great place to start. To be fair, this was for Gaga's Harper's Bazaar spread, so it's not like she was going to Starbucks like this. But she could do some major damage with those. Chilling. Yes, even Gaga rocks neatly trimmed nails with a touch of polish from time to time. Now that's something that anyone can do.